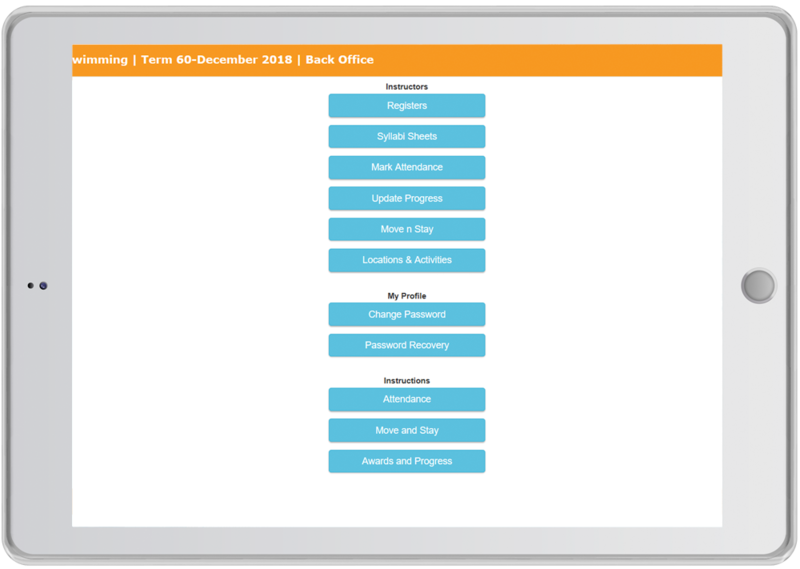 With our roots in the leisure industry, we offer affordable course management software which can help YOU save time, reduce administration, simplify and take the stress out of collecting payments - whilst you maximise retention and profit. We pride ourselves on continuous development, focussing on real world needs, and providing solutions which assist with the above! Both SwimSoft Online and MOR Leisure have been built and developed by MOR Solutions, and are our leading products. From smaller private businesses, to large leisure chains, MOR Solutions has a software solution to suit! 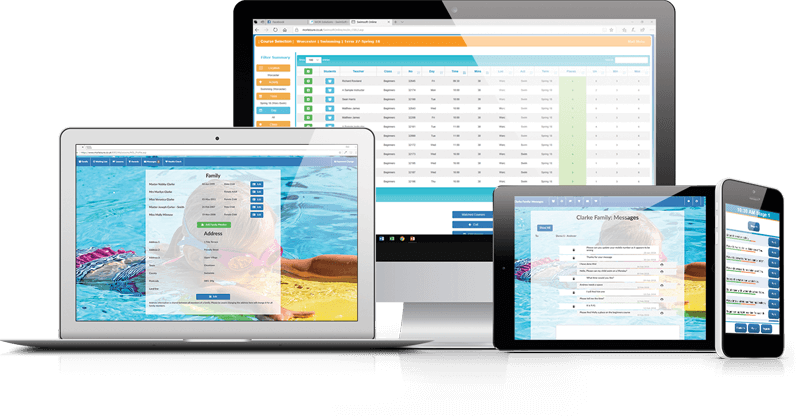 Both solutions offer the same features and benefits, with SwimSoft Online having a focus on swim school management. MOR Leisure is our generic course management solution – perfect for businesses who offer courses in one activity, or in a mixture. 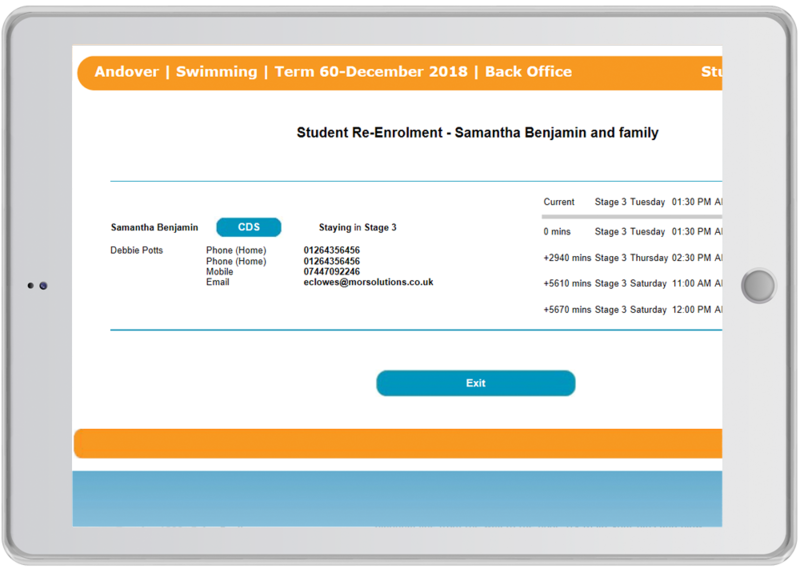 SwimSoft Online is our course management solution designed specifically for swim schools, with the most popular awarding bodies’ syllabus and awards systems pre-loaded. 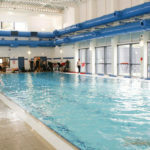 We have been helping administrators manage swimming lessons since 2005. 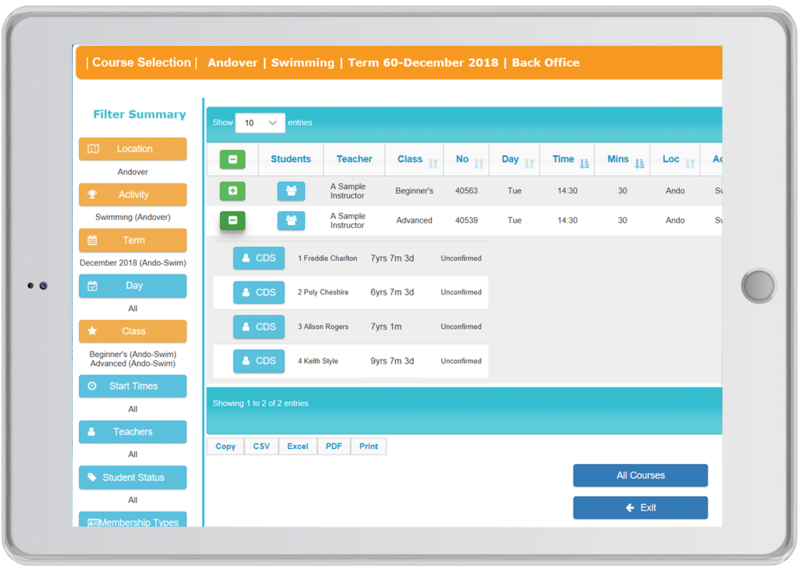 SwimSoft’s functionality is based on real world needs – the Swim Schools we support have reduced the time spent on administration by up to 50%. 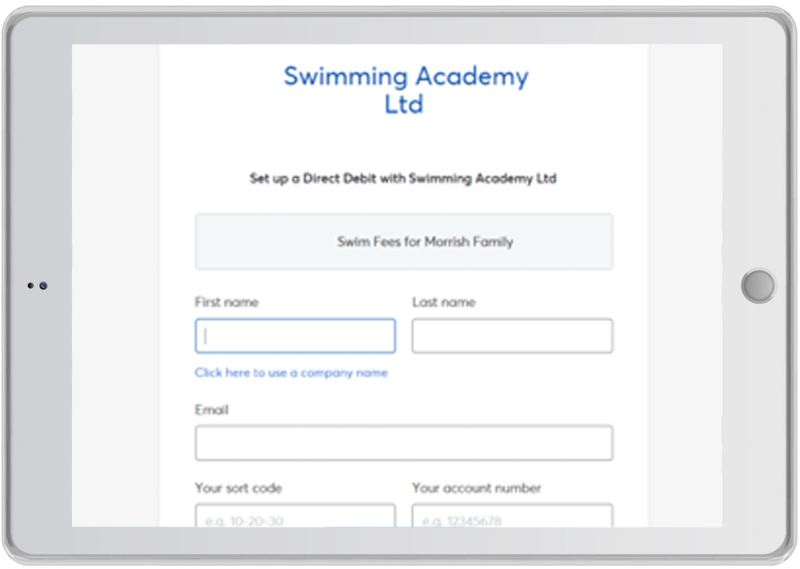 SwimSoft users can collect fees automatically, by Direct Debit or Payments Online in a few button presses. Ledgers are updated as fees are received, so there’s very little to do once you have requested payment - no more collecting and paying off fees manually. Our first client grew from 500 to 1200 students over a three year period, whilst time spent on administration was reduced. Since then many others have done the same. 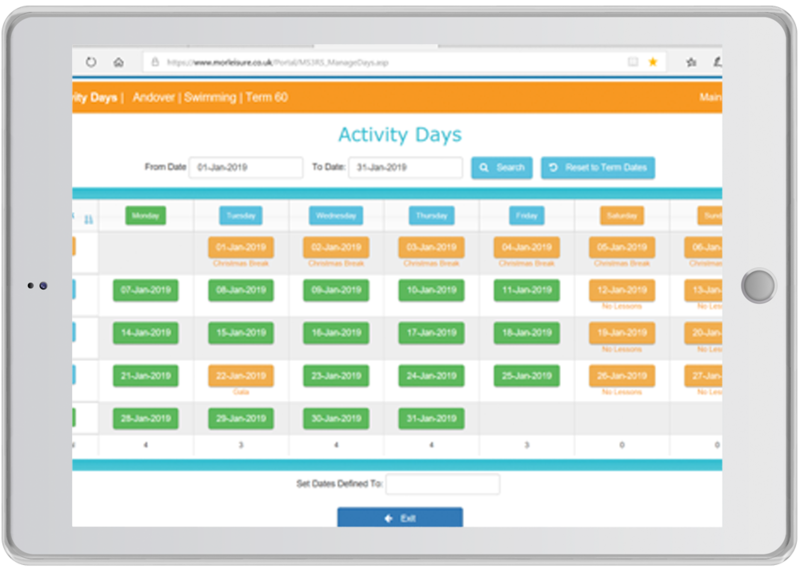 With the filter functions which can be used independently or in your desired combination, SwimSoft Online allows you to focus on the specific client group you wish to communicate with in just a few screen taps / mouse clicks. The dynamic field options also allow you to create either generic or very personalised communication to print, email or send by text message. Provide parents with information that they can access at any time, minimising the need for them to contact you with basic questions. Reduces administration, as clients can input, edit and maintain their own personal details. 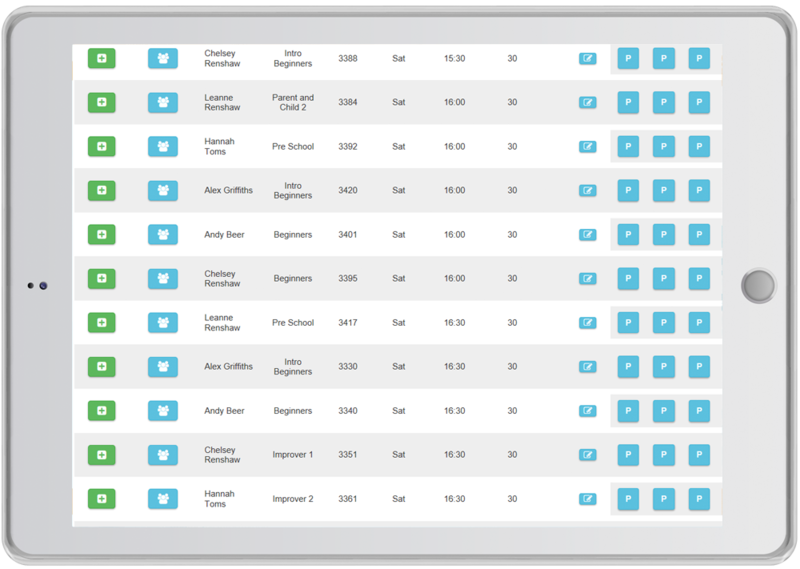 Support your teaching staff, whilst minimising administration, with Lesson Manager – a web app designed for swim teachers. Not allowed devices on pool side? Can be used at the end of the day for a few minutes to copy over from paper records! SwimSoft Online generates invoices and receipts, and offers dynamic reporting functionality to keep track of outstanding fees, monies collected over set time periods and much more! Credits can be raised individually or for specific groups, and full payment history is recorded against each client. 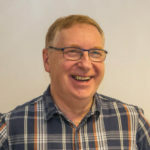 Founder and Managing Director of MOR Solutions Ltd, Richard built the original software solution. He continues to be very hands on within the business, working across the teams. 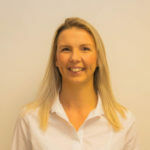 Emma looks after the sales and marketing side of the business, dealing with potential new clients and business opportunities, as well as ensuring our existing clients are kept up to date about news and developments. Lisa sets up training plans with each of our new clients, and leads them through the set up and training when they first join us! 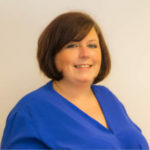 She is also responsible for the development of our support resources. 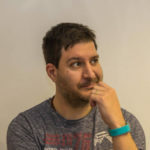 Robert is responsible for all of the technical aspects of the software, from making changes where we feel they are needed, to working on bigger projects for new aspects of the solution. Manage your clients learn to swim journey… from anywhere. Whilst most administrators will manage their swim school from an office or their home, the truth is you can run our system from anywhere. We have clients who have logged in and worked from their beach hut, an airport, and their second home abroad. Essentially SwimSoft Online allows you to work wherever you want, whenever you want! Run your business the way you want to… collect fees - monthly, bi-monthly, every half term or every full term. SwimSoft Online is extremely flexible, meaning that in many cases it will support your current business model without you having to make major changes to the way you work. So whether you want to run courses continuously or break over the summer, just define the days you want to teach. You can even run crash courses (and other activities) alongside your normal program. 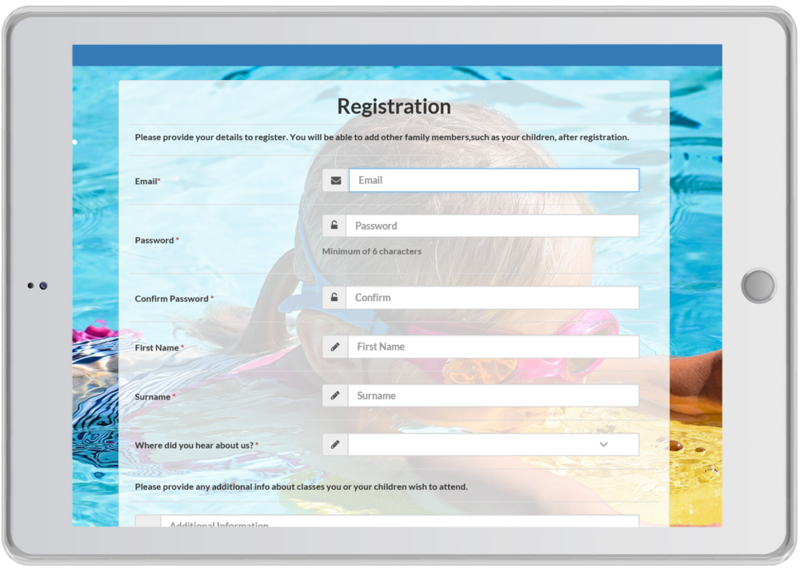 No barriers to stop prospective clients joining your swim school… They can register for lesson online. If your potential client has access to the internet they can register for lessons. 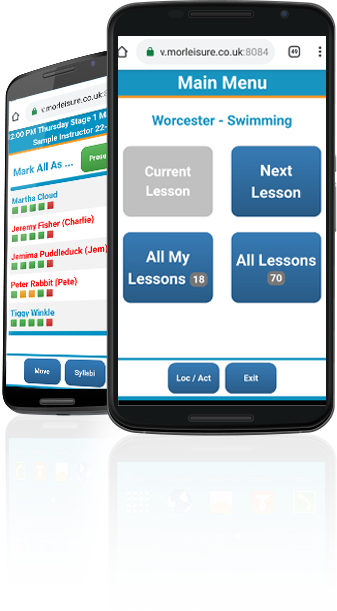 Our client portal (My Lessons) registration system works perfectly on a phone screen, tablet or PC, with the screen reformatting as required. 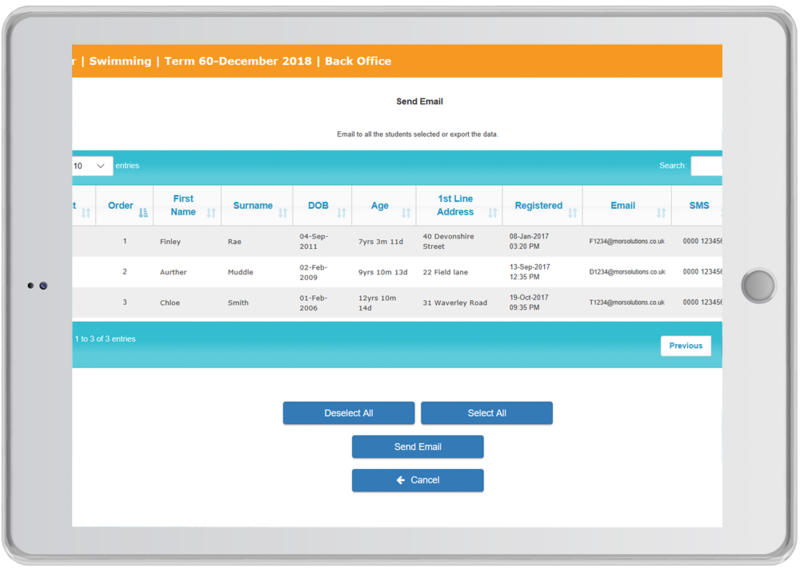 Potential clients don’t have to visit you or your premises to ‘Create an account’ with SwimSoft Online - data is checked then added to your database, meaning no more copying details from application forms. Place allocation is child’s play... find out about SwimSoft’s ‘Place Availability’ search - it will save you hours! It’s not uncommon for clients to want spaces for 2 or 3 children, as well as wanting them to swim at the same time! The image shows how (in four button clicks) we found spaces to allow a ‘Beginner’ and an ‘Advanced’ swimmer to attend lessons at the same time! We can even see who is on the course, so we can match ages and abilities if necessary. No place to offer? No problem… SwimSoft Online has comprehensive Waiting List functionality. 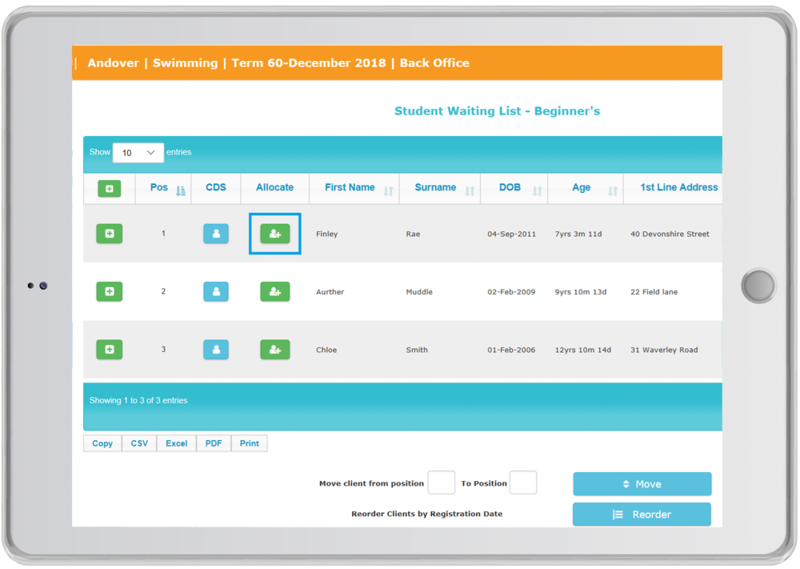 SwimSoft Online’s Waiting List functionality allows you to add clients to categorised lists, record notes and email potential clients as and when spaces become available. You can also: remove people easily, move them up and down the list, and re-order them by date joined, all in just a few button clicks. How accurate is your waiting list? …SwimSoft Online helps you keep yours up to date! 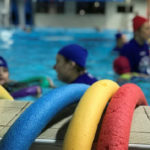 It’s not uncommon for parents to register for lessons at several establishments, and then take the first lessons that become available, which might not be at your swim school! Meaning your waiting list will become out of date as student find place elsewhere, leaving administrators not actually knowing who still wants a place! With SwimSoft Online, you can email or text clients on your waiting list to find out who still want a place! Allocating a client a place from the waiting list is easy too… with just a single push of a button! In single button press you’ll be able to see all relevant places which are available. 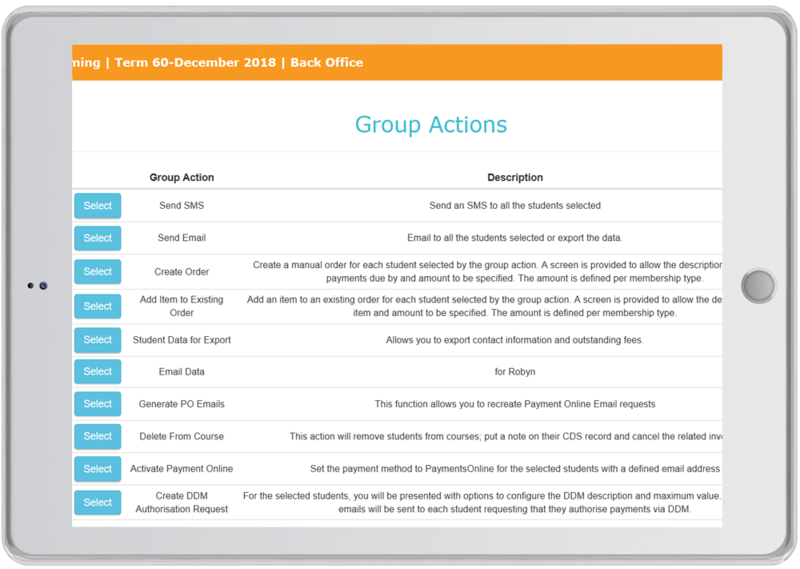 If you decide you want to place the student, communication will be automatically created for you - typically an invoice ready to be emailed - and finally the client will be removed from the waiting list. Create email communication as you work… and hold it for you to proof. SwimSoft Online holds communication (typically emails) for proofing before they are sent. This ensures the correct communication is sent to the correct client first time, meaning if you make an operational error you can correct it. When it comes to communication we have the philosophy; create, hold, check, send. So you can be human and make mistakes, and correct them without your client being aware. Clients don’t need to visit your centre or pool to sign up for Direct Debit... all you have to do is send them a simple email. Direct Debit is by far one of the easiest ways to collect fees from clients. It’s not complex - a system can commissioned in under 30 minutes. Then just email your clients a link asking them authorise collections. With SwimSoft Online clients do not need to sign paperwork in person. It’s easy to track who needs to pay you… and just as easy to chase late payers. Our user-friendly reporting functions allow you see, at a glance, whose fees are outstanding. Reports can be filtered to only show clients with overdue balances and you can communicate specifically with these people. You can also run the report the day before the payment deadline and pop an email out to anyone who hasn’t paid to remind them, and hopefully reduce the number of late payers. What works better - a poolside device or detailed paper registers?… that’s up to you - we offer both. You choose what you want to use on poolside. 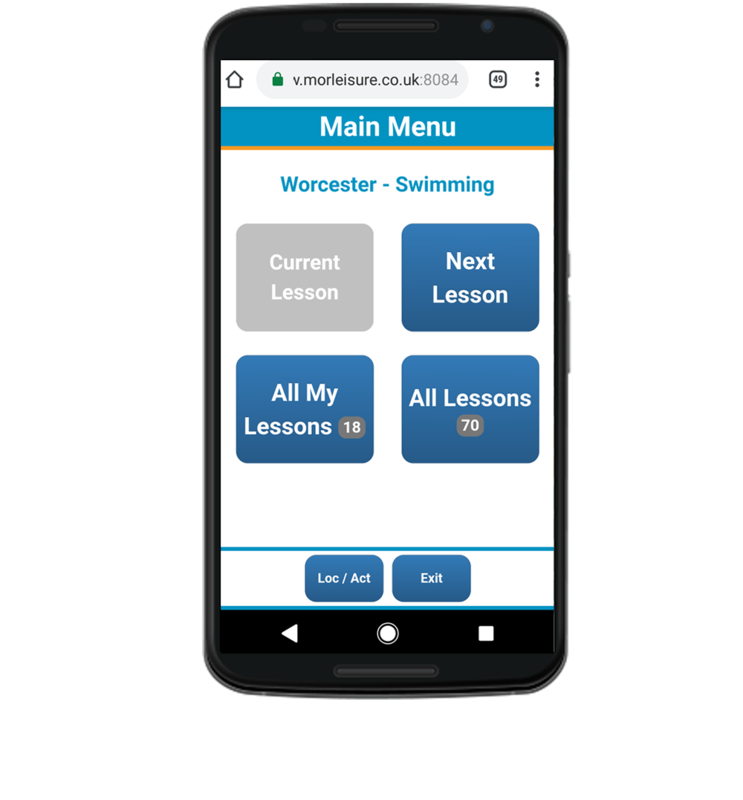 Our poolside software ‘Lesson Manager’, requires no synchronisation (it works via Wi-Fi and 4G) and you’ll see your current lesson information instantly, you don’t have to fight through screens to see course information - allowing you to focus on your students. It’s really simple; just enter your 4 digit security PIN. If the device has no battery, or stops working - don’t worry all the data has been saved on your main system; just get a new device and carry on. Support your teaching staff prior to lessons starting... by allowing them prepare for lessons. We give teaching staff appropriate access to SwimSoft Online. Using any internet connection, your team can have access to data pertaining to the whole course. This allows them to review the students they will be teaching, update attendance and prepare lesson plans – all when they have time to work (any time of the day or night!). Leverage the power of SwimSoft Online to promote your business... professional progress reports can set your business apart from others. 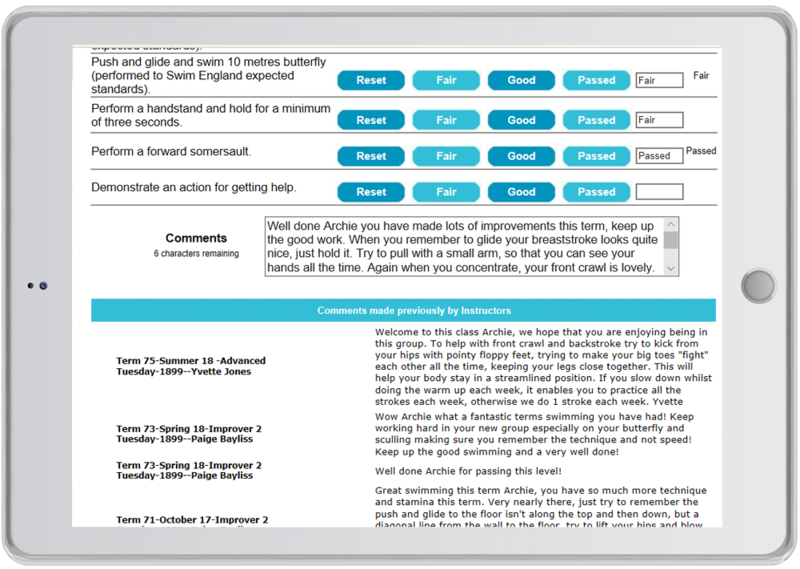 SwimSoft Online allows teaching staff to write comments to be included in progress reports, which in turn can be emailed or printed. It’s important that each comment is appropriate and not repetitive, so SwimSoft Online shows the comment written on previous reports, even if the client was taught by a different teacher. Progress Reports are great for clients who aren’t due to receive a certificate, and for younger children to take to show and tell sessions at school and show Grandparents too! 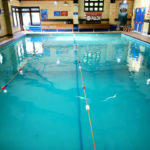 The first being great promotion for your swim school, setting you apart from other providers. Certificate overprinting reinforces your professionalism… it’s the icing on the cake! As the director of MOR Solutions Ltd, I am very pleased that my parents thought to keep a selection of the awards I achieved as a youngster - they hold fond memories and are nice to look back on from time to time. Today, as one of the architects of SwimSoft Online, I encourage swim schools to overprint and issue certificates, enabling the parents of today to have keep sakes for their children. If you’ve got great hand writing you won’t need this facility, but if like me you don’t, you’ll find you can create great certificates. Don’t panic when the unexpected happens…SwimSoft Online’s powerful filters combined with its ‘Group Actions’ will save the day! 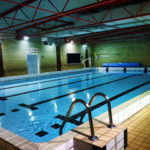 On the 30 November 2018, a swim school we support experienced a power cut in the middle of the afternoon. The administrator took out her mobile phone, logged into SwimSoft Online, and used the advanced ‘SMS’ group action feature to text all the clients that were booked in for lessons later in the day - a process that took just a few minutes to complete. The next day she used another of SwimSoft Online’s group actions to issue credits. The whole incident was handled within an hour or so. The image shows a list of SwimSoft Online’s group actions we’ve built to assist swim schools. We’ll help you re-enrol student (even if you run continuously)... it’s another base we’ve got covered! Our course searches will enable you to see where and when you have space – especially handy when students move around, whether it’s because they are progressing to another level, have other commitments, or are going to school. 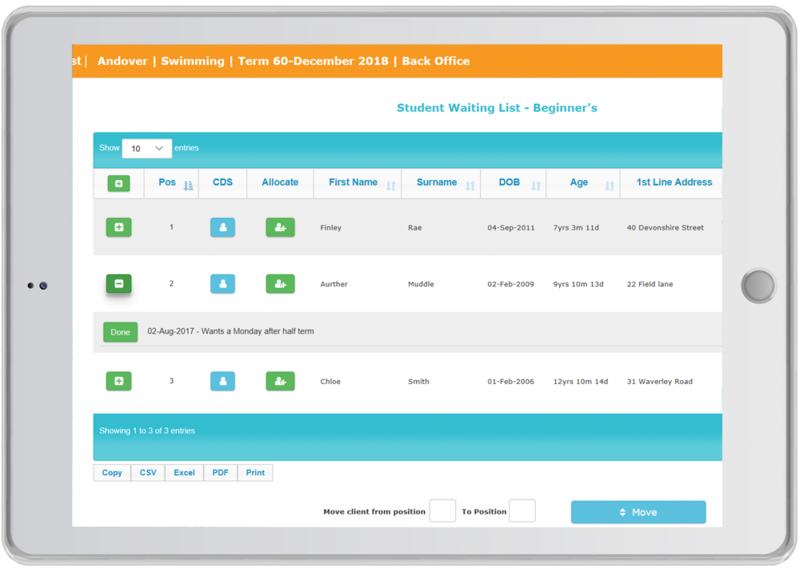 SwimSoft Online will help you review your program so you’re running as efficiently as possible and place students appropriately- it’s just one of many useful screens. To be kept up to date with news, development, offers and competitions, please subscribe to our mailing list by entering your email address below! We have included some quotes from our clients below – just click on a pool! If you would like to speak directly to an existing user, please let us know and we can put you in touch with someone! The support from the team at SwimSoft has been excellent and our business is now running better thanks to the integration of our classes into their Swimsoft solution. 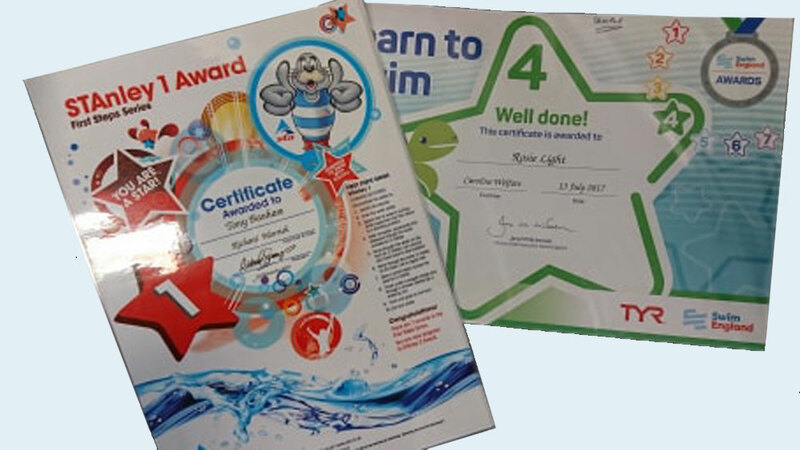 It has facilitated a significant improvement in customer communication and business management for the swim school whilst also enabling customers to update and access information themselves. I would recommend their service to any professional swim school or operator wanting to grow their business. Been using the system from the start, and it’s always improving. Richard and the team are brilliant….. SwimSoft has improved my business, increasing my revenue and decreasing my admin time. Brilliant. 5 STAR! We opened in 2015 and SwimSoft was the first ever software we used, however, at the time we were not able to let parents see their child’s progress so we changed to another company. After a year using another system and having so many issues, we came back to SwimSoft and have been with them ever since. The system is constantly being upgraded and now my parents can have their own portal, everything is easy to use and if I have an issue I phone the guys or email them and their response time is fab, they are really helpful and nothing is too much trouble. I do have the advantage of being close by and I’m always welcome for a brew and chat. Will not be going anywhere else now they are stuck with me. 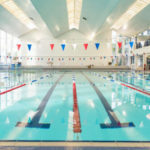 We have used Swimsoft for 10 years and firstly I can’t fault Richard and his team for being so supportive all the way through installing the programme to even now when a query comes up. 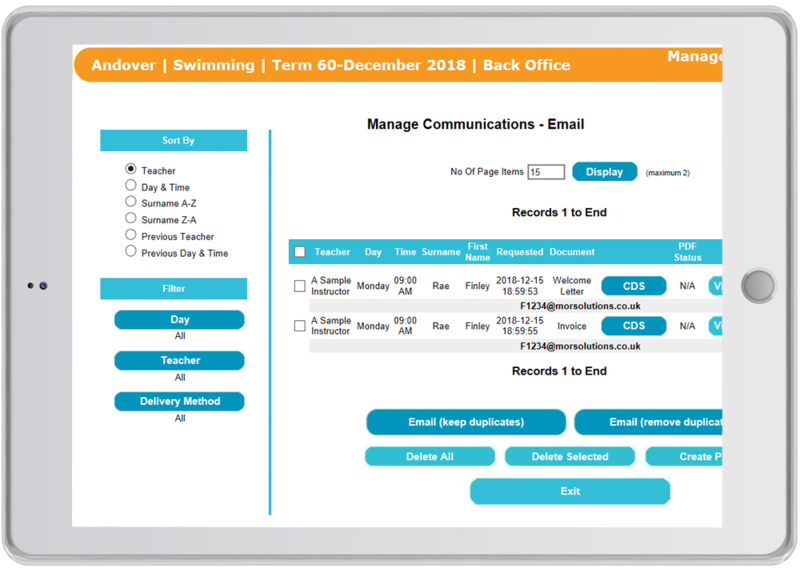 We are a large swim school and Swimsoft has added so much value to our customers making communication so easy and the whole rebooking process so much quicker. Swimsoft hasn’t only improved our service but made it quicker and helped cut down on costs they have a great team helping you all the way, I can’t recommend SwimSoft enough, thank you guys!